Home > monthly wine writing challenge, Wine Writing Challenge	> Is There an Epiphany For The Oenophile? Is There an Epiphany For The Oenophile? This post is an entry for the 17th Monthly Wine Writing Challenge (#MWWC17), with the theme of “Epiphany”. Previous themes in the order of appearance were: Transportation, Trouble, Possession, Oops, Feast, Mystery, Devotion, Luck, Fear, Value, Friend, Local, Serendipity, Tradition, Success, Finish. I have to admit – when it comes to the Monthly Wine Writing Challenge, I don’t have a straight record. I participated in many, but definitely not all. Of course lots of it has to do with the theme. Some of them I loved initially, only to find out that they are much harder than I thought (MWWC16 “finish” would be a perfect example). Then there were some which seemed difficult from the get go, and they didn’t disappoint (”devotion” would be my favorite example of an extremely difficult theme). But the key word here is “Challenge”, so let’s just roll with the punches, shall we? Epiphany is definitely a very difficult theme. Hold your horses – I’m not generalizing, I’m talking about myself. It is a very difficult theme because the word epiphany is not a part of my vocabulary. I don’t think I consciously used the word even once. To me, it has strictly a religious connotation, and I have to honestly admit that I’m not a very religious person. Yes, it is a difficult word for me. Okay, so we are not going to talk about the first and second meanings – not in this blog for sure. That leaves us with with the range of options in the meaning #3. I feel good about discovery, realization, revelation, sudden perception – still, the epiphany has too grandiose of a meaning for me to be able comfortably use it. My forming journey as an oenophile was full of discoveries, revelations and realizations, but was the epiphany hiding somewhere along the way? I’m not so sure. Let’s take a look. My serious introduction into the world of wine happened about 10 years ago, when I took Windows on the World Wine course thought by one of the best wine educators out there – Kevin Zraly. My first major discovery in that class was Amarone, 1997 La Ragose. Amazing dried fruit and raisins on the nose, promising a sweet wine – and then dry, perfectly balanced and well structured wine on the palate. This experience became engraved in my memory, for the good and for the bad. What is bad about it, you ask? Absolute majority (with a very few exceptions) of Amarone I tasted since, including the other vintages of La Ragose, didn’t measure up to that first experience. I keep claiming Amarone to be my favorite wine, which typically only leads to disappointments. The next memorable moment was during the class on Champagne and sparkling wines. Three or four wines were served blind, and Kevin asked to see a show of hands as to who liked what wine. There was somewhat of an even spread among few wines to be the favorites, and there was also practically a uniformed dislike of one of the wines. Right before the wines were revealed, Kevin said something which again became forever engrained in that same memory of mine. He said “this is why, people, you shouldn’t drink the vintage Champagne”. The wine everybody disliked (myself included) was 1996 Dom Pérignon, one of the very best vintage champagnes ever. Vintage Champagne is an acquired taste – majority of the people have to really get there before they can claim that they like it. I’m really curious how many people never said the truth about that sip of highly acclaimed Champagne, often synonymized with success (if you care to step forward, just do it – you will not be judged, for sure not in this blog). I gradually moved up through the Champagne taste ladder to honestly claim my love for the heavy, yeasty, complex vintage Champagnes, but believe me, it’s totally okay to be indifferent to them. Many of my other wine discoveries relate to the wonderful wine store in the New York City, PJ Wine. I mentioned that store many times in the different posts in this blog – in my opinion, the store deserves all the praise it can get. In 2009 I attended PJ Wine Grand Tasting event in New York, and the wines which were presented in that event were nothing short of amazing. This is where I was mesmerized by Krug, both vintage and Grand Cuveé, Château Margaux and Château Léoville-Las Cases, both from the legendary 2000 vintage, 1999 Vega Sicilia Unico, 1922 D’Oliveira Madeira – all of those wines created lasting memories. I remember keep coming again and again for another glass of that Vintage Krug – most surprisingly, it was available for a while. Epiphany? I’m still not sure. Boy, what I do truly regret now that I really didn’t start blogging at that time (but I should’ve!). The year later, I discovered Spanish Rioja. Again with the help of the PJ Wine. The store offered a Rioja tasting seminar on Saturday, it was free, and I decided – why not? The very first taste of the young Viña Real (2004 or 2005), 6 other Rioja wines in between and the last taste of the mature, but still bright and vibrant 1964 Pagos de Viña Real turned my wine world upside down and squarely put Rioja on top of it. The year after, at a Spanish wine festival organized by … yes, you guessed it – PJ Wine, I tasted 1993 Lopez de Heredia Viña Tondonia Reserva Blanco and 2000 Viña Tondonia Rosado – again, a revelation. Complex and vibrant white of tender 18 years of age, and still fresh Rosé of 11? Truly impressive. Are you tired yet? There were more, lots more. How about 48 years old wine, mature, but yet delicious? No, not Hermitage, not Bordeaux, not Burgundy. 1966 Louis M. Martini Pinot Noir from Napa Valley. The wine which was just honestly made, without any expectations of longevity – yet a beautiful wine, still bringing a lot of pleasure? Was drinking this wine an epiphany? I don’t know – to me, it was simply a stunning and memorable experience. Then there was 1947 Imperial Gran Reserva Rioja – how can the wine much older than me be so alive and beautiful? Fiction by Field Recordings – the wine which transports you to the blooming summer meadows on the first smell – should that be called an epiphany? Or the Antica Terra Phantasi from Oregon, the white wine with pungent, savory aromatics which taught me that there are white wines which taste amazing at the room temperature (many Roussanne and Marsanne wines do). You are not going to stop me now. There was Rozès Over 40 Years Old Porto – the fragrant, effervescent, uplifting wine, sip of which says “nirvana” – nope, still no epiphany though. My first taste of the wine directly from the tank – cloudy, still an “ugly duckling”, but delicious Chenin Blanc at Paumanok winery on Long Island – may be? The Merlot grape juice, dripping right from the sorting table with just harvested grapes – was that it? Or may be it was the wine which most likely will never be bottled – a 1970 White Port right from the tank, right in the cellar of Quevedo winery in Douro? Let’s draw the line here – that memory lane is getting longer and longer. Was there an epiphany in any or all of what I told you? I don’t know. There were a lot of amazing discoveries, revelations, special moments and memories – what is even more important, these special moments continuing – it is really easy to get me excited with the good wine. I will have to let you decide if there is an epiphany for the oenophile – best if you would write your own post. And for me? Can I please have another glass of Vintage Krug? Cheers! P.S. I would like to thank John The Wine Raconteur , the winner of the #MWWC16, for the great theme which facilitated this highly enjoyable memory trip for me. Nicely done, Anatoli. I had to think of devotion as well, when I saw the theme, and how equally difficult this was for me…including the trick to revert to the dictionary. It was cool to follow some of your wine journey, and to think that it’s really only been 10 years. Crazy. Great post, Anatoli! It looks like you had an amazing wine journey so far 🙂 The next time I am in NYC I’ll definitely want to check out PJ Wine. They sound like a very good wine shop from what you describe. I think if I decide to write a post for MWCC (would be my first entry) then I’d interpret Epiphany like you did. I never really know what’s stopping me. 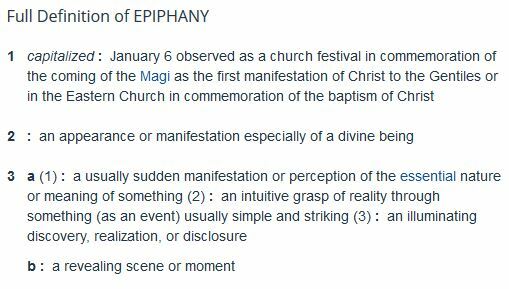 Maybe Epiphany is a good theme to start. Will see. Cheers! Julian, you should definitely write! It is fun, and you have nothing to lose – however, you have to get (for the most of us, at least), out of your comfort zone, and this is why this is called a “challenge”. Don’t delay – write! Tough job, i’ll join you with the Krug! Sandra, thank you very much for your generosity! Please, please come on over with that Krug! Such an enjoyable post! I know what you mean about an “acquired taste” with certain vintages of Champagne. I’ve grown to appreciate that yeasty, brioche taste in finer Champagnes. Second fastest entry in the history of the Challenge–had you been sitting on this? Or was it pure inspiration? I think the first time I went to Sonoma and had the chance to talk with people as I tasted was the initial, but there have been several along the way. Cheers! Anatoli, Bravo! That is what I wanted to see in print, some of the wines that moved us, because there are so many wines that we just enjoy. You certainly had some great memories. Seeing The World Through The Pink Glasses Do You Have Wine With Your Apps?